5% of every dollar we take in goes to our local humane society. 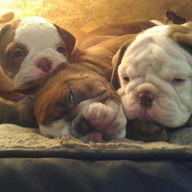 We boadcast all of our puppies live from birth to leaving for thier new homes. Click on the brown puppy below to go to my website. We are near Afton Minnesota. Thanks for watching!